Havana, Vinales, Cienfuegos, Camaguey, Santiago, Bayamo, Trinidad, Santa Clara, and more! Cuba is the last bastion of socialism in the Western Hemisphere and has, only recently, begun to break free from the shackles imposed by the negative associations of communism. Indeed, it is Cuba's long isolationism that proves one of the main attractions for travellers, as destinations untouched by Western influence are now so few and far between. 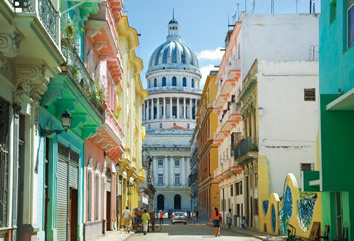 One must only explore the cities, like the capital, Havana, to appreciate fully the unique charms of the country. 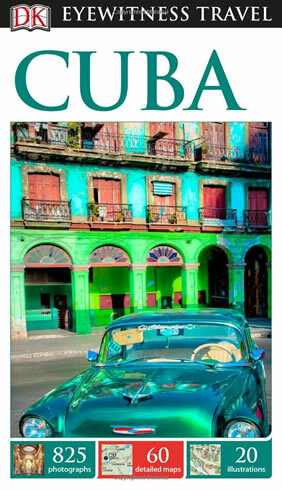 With their colonial architecture, plethora of 1950s American cars, and imposing Revolutionary monuments, Cuban cities are strikingly unusual in history, colour and character. These street scenes are only enhanced by the laid-back lifestyle and friendly disposition of the Cuban people—a population of largely Spanish and African descent—with the result that Cuba is an up-and-coming destination to be visited sooner rather than later. NOTE: Outgoing Adventures is a Canadian-based company and does not hold a licence that allows US Citizens to legally visit Cuba. The decision to participate in our tour, and any possible legal implications thereof, are solely the repsonsibility of the traveller. Today we arrive in Havana and transfer to our hotel in the heart of the old city. Upon arrival in the city, the vibrancy of the people is one of the first noticeable things. Also striking is the fact that, day or night, music can be heard and most evenings, somewhere in the city, people can be found dancing in the streets. The rich history of the island is apparent in the faces of the people. They are the descendants of the Spanish conquistadores who colonised the island in the sixteenth century and African slaves brought over to work on the tobacco and sugar plantations. Cuba's cosmopolitan capital was once one of the world's most prosperous ports and the third most populous city in the Americas. As La llave del Mundo (Key of the World), it saw riches from Mexico, Peru, and Manila pass through her sheltered harbour to Spain. Havana shows evidence of long neglect but her beauty shines through an amalgam of Spanish, African, colonial, communist, and capitalist influences. Today we start with a panoramic tour of Havana with a drive along the Malecon, and a stop at the Revolution Plaza before making our way into Havana Vieja (the old city). 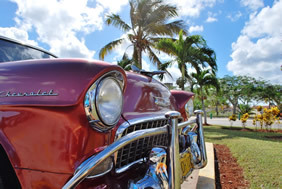 Highlights will include a stroll down Prado Avenue, for many years Havana's most important and impressive avenue. Built in 1772 by the government of the Marquis de la Torre, it was originally known as Alameda de Extramuros. In 1928 the avenue was remodeled into its present form. 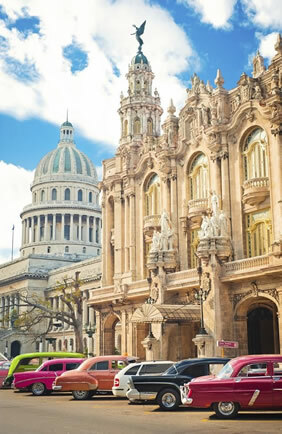 This stately thoroughfare is home to the Capitolio Nacional, the Gran Teatro de la Habana, and the Parque Central (a favourite gathering place for Cubans). It'll become evident why UNESCO declared this region a cultural and natural World Heritage Site in 1982. We'll also visit the Museum of the Revolution, located in Old Havana. The museum is housed in what was the Presidential Palace of all Cuban presidents from Mario Garcia Menocal to Fulgencio Batista. It became the Museum of the Revolution during the years following the Revolution. Portions of the museum are also devoted to pre-revolutionary Cuba, including its War of Independence waged against Spain. Our walking tour takes us along the main streets of Old Havana to visit the Plaza de la Cathedral, the Plaza de Armas, the Plaza de San Francisco de Asis and the Plaza Vieja. We also visit the Plaza de la Revolution and the Cabana Fortress, built after the British invasion of 1762. Later today we depart Havana and travel by road to the Vinales Valley, reminiscent of Guilin in China because of the curious limestone mountains and rock outcroppings. Day Summary: This is an important day of introduction in the capital. We will learn much about Cuba's history, pre- and post-Columbian, with much emphasis on the Revolution and independence from Spain. We'll also enjoy the city's colourful and rich architecture, and encounter many friendly locals as we move through on our tour by bus and foot. As throughout this tour, if possible, we will do our best to enjoy our evening meals prepared by home-run restaurants and interact with the family-operators and other patrons. The Vinales Valley is considered a National Park and was recently proclaimed by UNESCO as a Natural World Heritage Site. This morning we take a leisurely walk through the countryside passing by crops of tobacco, yucca and corn before joining up with our vehicle again. We may be able to visit a tobacco farmer's house; the inhabitants of the valley will readily invite visitors in for a visit. We then go around the corner to the State-run rationing store where our guide will explain to us what the state supplies, how much, and how the system works. 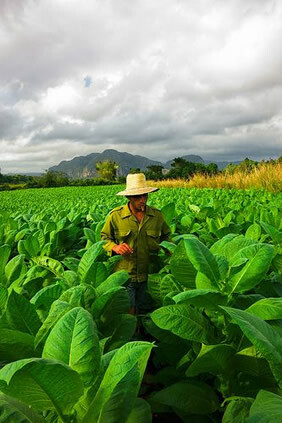 We have a chance to see a tobacco plantation where the tobacco leaf is sorted (despalillo), graded, even fermented and then stored until the time is right for the leaf to be rolled. In Pinar del Rio we visit a state run tobacco factory where such brands as Cohiba, Montecristo and Romeo y Julieta cigars are made. Day summary: Our educational content is strong today, with ongoing emphasis on local economies, crops and the processing and sale thereof, pre- and post-Revolution life, and small-scale market and subsistence family-farming. As our day progresses, we'll have opportunities to interact with people working in these various fields and learn about their everyday lives. Today we have breakfast early and set off towards Central Cuba to the charming city of Cienfuegos, on the island's southern coast. The city of Cienfuegos is known amongst Cubans as 'The Pearl of the South' and its colonial centre was named a UNESCO World Heritage site in 2005. Cienfuegos is the only city in Cuba founded by French migrants fleeing the slave revolution in Haiti in the early 19th century. Referred to as the Oriente by most Cubans, this region contrasts with the rest of the island in many ways. The racial mixture is slightly different due to the influx of Haitians in the late 1700s which gives some cities a distinct Caribbean feel. Another distinctive feature is the lush green hills and mountains that rise above the humid plains. The Oriente is also the birthplace of many revolutionary heroes, as well as the starting point of both the War of Independence and Fidel Castro's initial attack on the Moncada Garrison in 1953. Castro later returned to Santiago in 1959 to accept surrender of Batista's army. When travelling the eastern provinces you'll discover nearly every city has some type of memorial or revolutionary point of interest. Cubans are very proud of their independence and take great interest in preserving and showcasing revolutionary artifacts. Day Summary: A full but interesting day with themes touching on Cuba's ethnic diversity and the area's significance re the Revolution and local heroes. Cuba is far from homogenous in terms of ancestral origin, and the country's many regions reflect this in their myriad unique customs and traditions, art forms, belief systems, sports of interest, and physical appearance. We'll learn about indigenous peoples of Cuba and notice the distinct Caribbean vibe of the place. Departure to Camaguey, the third largest city in Cuba. On the way to Camaguey we´ll visit the city of Sancti Spiritus, a provincial capital and one of the first seven villages founded by the Spanish in the early 16th century. This is a quiet, parochial place steeped in history. Its inhabitants are proud of the Iglesia Parroquial Mayor del Espiritu Santo; the oldest operational church on the island, as well as Puente Yayabo, the only European-style redbrick bridge in Cuba. Lunch break in Sancti Spiritus, then continue to Camaguey for the night and an informal look around Camaguey. The streets here are a labyrinth, designed to confuse the corsairs who had previously terrorized the town. In fact, not two streets are parallel in the city's centre. Camaguey is Cuba's third largest city, but the mass tourism that we may have encountered earlier is refreshingly absent here. One nickname for Camaguey is the "city of plazas" so we focus on 3 or 4 plazas as landmarks. We admire the Casa de la Cultura, with its freshly restored facade. For a donation, you can climb to the building's roof and get a good view of city. Nearby is the Soledad Church, one of the oldest in town and originally a hermitage. Our tour takes us into Plaza Maceo, pleasant with its shady spaces and charming cafes. We continue a few more blocks to the beautifully restored 18th C Plaza San Juan de Dios, aka Plaza Padre Olallo, probably the nicest in the city. Day Summary: A full day of travel and sightseeing. An important ongoing theme will be touched upon again with respect to anti-colonial history and historical figures, notably General Antonio Maceo y Grajales. Few other Cubans have been worthy of the profound and genuine recognition he earned for himself as the leader of Cuba’s most epic anti-colonial struggles. Maceo was oft-referred to as the “Bronze Titan” because of his skin colour and his heroism in daring military campaigns. There is a plaza in his name here, as well as for Ignacio Agramonte y Loynáz, a Cuban revolutionary who played an important part in the Ten Years' War (1868–1878). Transfer to Santiago de Cuba, known as the ‘city of heroes’ for the important role it played in the island's Independence and Revolutionary struggles. 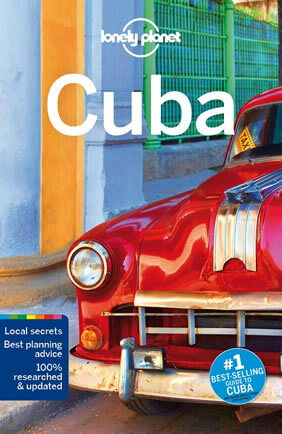 Santiago is the second biggest city in Cuba and rivals Havana in literature, music and politics. It's also rich in traditions and folklore and almost every street corner is wrapped in legend. Surrounded by impressive mountains that link the Sierra Maestra to the sea, Santiago is made up of hills that overlook an intensely blue bay. As we drive, we will notice many school children in their uniforms. Our tour doesn’t include a visit to a school as we can't guarantee that a visit to a school would be possible or appropriate. Despite this, however, the topic of education in Cuba is important, and we'll have plenty of time to learn about it from our guides, students, and parents as we go. Surrounded by impressive mountains that link the Sierra Maestra to the sea, Santiago is a city of hills and inclined streets, with numerous places of interest and a history linked to struggles for national independence. It is also a city that brings together people of African and Spanish origin, along with descendants of emigres from the French West Indies. Thus Santiago is a veritable melting pot whose colourful identity is an outgrowth of its rich human heritage. This morning we visit the Morro Fortress, dramatically perched over the mouth of the bay. We also visit the Santa Ifigenia Cemetery which resonates with history. On the main square we stop to visit the house of Diego Velasquez, the oldest in Cuba which dates back to the beginning of the 16th century. We'll also visit the Museo Municipal Emilio Bacardí. Founded in 1899 by rum magnate, war hero and city mayor Emilio Bacardí y Moreau (the palatial building was built to spec), the museum is one of Cuba’s oldest and most eclectic, with some absorbing artifacts amassed from Bacardí’s travels. These include an extensive weapons collection, paintings from the Spanish costumbrismo (19th-century artistic movement that predated Romanticism) school, and the only Egyptian mummy on the island! We'll also visit the Museo del Carnaval, displaying the history of Santiago's Carnaval tradition, the oldest and biggest between Río and New Orleans. Renowned for its colourful carnivals featuring Chinese trumpets, French tumbas (a kind of drum) and all sorts of revels, the city is also famous for its people, who are hospitable, cheerful, and imaginative lovers of life; in short, typical West Indians from what has been dubbed the Capital of the Caribbean. Day Summary: Today we have the chance to learn more about the Revolution, the role religion plays in everyday Cubans' lives, as well as more about the colonial past of Cuba. Departure to the charming city of Bayamo, the provincial capital of Granma. We will stop on the way to visit the most sacred place for Cubans “El Cobre Church”. 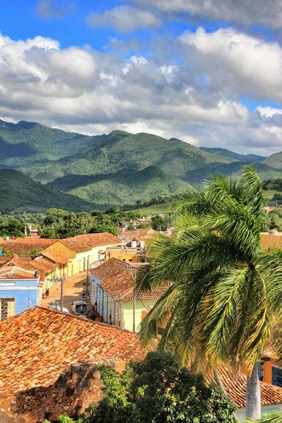 Bayamo was the second town or "villa" founded by Diego Velazques in Cuba in 1513; these days it's a pleasant, relaxed provincial city with a friendly atmosphere. Granma was the hub of the revolution, and this is reflected in its capital's many poignant monuments and revolutionary dedications. Bayamo is also renowned as the birthplace of leading artists, writers and musicians, such as the composer of Cuba's national anthem, Perucho Figueredo. Women from Bayamo are said to be the prettiest in Cuba, inspiring La Bayamesa, Cuba's favourite love song. A short tour around the main square, we'll discover more about the area’s most famous resident Carlos Manuel de Céspedes (1819–1874). He was a Cuban planter who freed his slaves and made the declaration of Cuban independence in 1868 which started the Ten Years' War. We'll visit the Provincial Museum, where we see the Cuban 'Swiss Army' knife that Che used, interesting photos of the revolution from the region, and war memorabilia from the local heros. Today we transfer back to Camaguey. 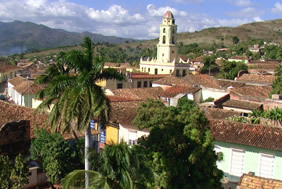 One of the first seven "villas" or towns founded by the Spanish in Cuba in the early 16th century, Camaguey's historic center was declared a UNESCO World Heritage site in 2008. This sleepy colonial town is sprinkled with large bulbous clay jars known as tinajones, originally used to transport wine, oil and grain. They were introduced by the Spanish as a solution to the city's water shortage and have become a symbol of Camaguey. On arrival we'll include any sightseeing possibly left over from our last visit. You'll likely have some much-deserved free time on this rather busy trip! Camaguey has a famous ballet, though it's schedule is difficult to predict with any accuracy. Your Tour Leader should be able to find out about any possible performance this evening. Today we have a long drive towards Trinidad, a UNESCO World Heritage Site since 1988 and perhaps the best- preserved colonial town on the island. En route we will pass through famed sugar plantations in the Valle de los Ingenios and learn more about this industry that was once the most important part of the Cuban economy. Exploring Trinidad is like stepping back in time, along the cobbled streets you’ll find many horse drawn carts acting as taxis, cargo trailers and more. Within the city limits, there are many interesting museums in old colonial buildings to visit in your leisure time, but it is after the sun sets that Trinidad’s charm becomes even more apparent. This evening we recommend a visit to Casa de la Trova or Casa de la Musica for traditional Cuban music and dancing. Day Summary: As the region and Trinidad is a popular tourist destination, we will also witness and learn more about the tourist industry, from large all-inclusive sun-and-style resorts to casas particulares, and the trickle down effect (or lack thereof) for people working in related businesses. We also hope to experience one of the most important unifying aspects of Cuban life - music! This morning we tour colonial Trinidad (pop: 60,000). This is a perfect relic of the early days of the Spanish colony: beautifully preserved streets and buildings and hardly a trace of the 20th century anywhere. It was founded in 1514 by Diego Velazquez as a base for expeditions into the New World and Hernan Cortes, conquistador of the Aztecs, set out from here for Mexico in 1518. The five main squares and four churches date from the 18th and 19th centuries and the whole city, with its fine palaces, cobbled streets and tiled roofs, is a national monument and since 1988 has been a UNESCO World Heritage Site. In 1797 there were 56 sugar mills and 12,000 slaves imported to work in the sugar cane fields. With the Industrial Revolution and the increase in sugar grown in Europe, Trinidad went into decline in the second half of the 19th century. On the Plaza Mayor is the cathedral, Iglesia Parroquial de la Santisima Trinidad, built between 1817 and 1892. It is the largest church in Cuba and is renowned for its acoustics. On the left of the altar is a crucifix of the brown-skinned Christ of Veracruz, who is the patron of Trinidad. Day Summary: This is a relatively easy-going day, with sightseeing town-based and concentrating on matters colonial. We also have opportunities to learn more about Afro-Cuban culture and traditions, including Santeria. Originally used pejoratively by the Spanish to describe the religious/superstitious beliefs which gave more attention to the Catholic saints often in preference to Jesus Christ, Santeria now applies to the most popular Afro- Cuban religion. Departure to Santa Clara visiting Topes de Collantes along the way. Topes de Collantes National Park is part of the Sierra del Escambray or Guamuhaya Mountain Range, the second largest on the island. Its highest peak is Pico San Juan, measuring 1148 metres. Topes de Collantes is home to some of the most spectacular scenery in Cuba and is a delight for birders and walkers alike with its lush tropical vegetation including Caribbean pines, ancient tree ferns, bamboo and eucalyptus. The Escambray Mountains are home to isolated rural communities principally dedicated to the cultivation of coffee. We'll have a walk in the park before continuing our journey. Continue to Santa Clara, the provincial capital of Villa Clara province in central Cuba. The city of Santa Clara was founded in 1689 by settlers fleeing the coast and constant lootings by pirates. Today Santa Clara is an important university town but it’s best known for the historic events that surround revolutionist Che Guevara. Che led his rebel forces in the battle of Santa Clara, a decisive victory over Batista's army that resulted in the triumph of the revolution. Che’s remains were brought here from Bolivia in 1997 and are kept in an impressive mausoleum. After a morning tour of the city of Santa Clara and a visit to the Che Mausoleum we depart to Havana, Cuba's capital and the largest city in the Caribbean. Havana is the finest surviving Spanish colonial complex in the Americas and the seventh town Diego Velazquez founded in Cuba in the 16th century. Post-revolution restoration work and the millions of dollars invested since it was declared a UNESCO world heritage site in 1982 mean that Old Havana has been well-preserved and is often referred to as a “living museum”. The many marvelous monuments, cathedrals, and palaces of the city’s historical centre are brought to life by a constant hustle and bustle. This morning we travel 16 km outside of Havana to Finca Vigia ("lookout house"), the former home of Ernest Hemingway. Finca Vigia is located in the small, working-class town of San Francisco de Paula. The Cuban people have always respected famous writer's choice to live in a modest town, amongst the people with whom he fished. Built in 1886 by a Spanish Architect Miguel Pascual y Baguer, Finca Vigia was purchased by Hemingway in 1940 for a cost of $12,500. Here Hemingway wrote two of his most celebrated novels, "For Whom the Bell Tolls" and "The Old Man and the Sea." After Hemingway's death in 1961, the Cuban government took ownership of the property -- either with or without the approval of Mary Hemingway. You will have some free time to visit some worthwhile sites not covered by our sightseeing program. Near the Parque Central are the Capitolio and the Gran theatre (currently under renovation), Museo Nacional de Bellas Artes (Museum of Fine Arts) and the Music Museum. Near the Plaza de Armas: Castillo de la Real Fuerza (housing a small but good naval museum), Casa de Africa; Vintage Car Museum; City Museum, Corona cigar factory and cathedral. There is often a flea market around the corner from the Tejadillo, behind the cathedral, close to the water. And this may be the evening to sample one of Havana's famous music venues or take a stroll down the Malecon (waterfront promenade), which really comes to life in the evenings. Day Summary: Today is the day for summation, reflection, and supposition regarding the future of this vibrant, venerable nation and its people. It is also our last chance to shop, soak in the music and colour, and enjoy the effortless, welcoming smiles on the locals' faces. This evening we enjoy a farewell dinner and likely some Cuban music to see us off. NOTE: EARLY booking is essential for this tour. Well-located, heated / air-conditioned, mid-range (3-star) hotels with en suite toilet and bath throughout (probably shower only). Single rooms are limited and likely smaller than doubles. Porter service is sometimes available though you should be independent with your luggage, especially at airports. Because this tour ventures well beyond the built-up coastal tourist areas, one can expect the locally-owned, managed, and operated hotels and inns to be somewhat less "slick" that the larger, foreign-owned and managed resort-style properties. Hotels are carefully selected in terms of their ability to offer a safe and clean environment; that said, there may be some rough edges here and there and service that is not at the same level of efficiency which we expect elsewhere in the West. That said, the big highlight of this trip is to get off the trodden tourist path and immerse ourselves in the real Cuba. Road transport by private air-conditioned motor coach, 24-36 seats depending on ultimate group size. Though this is not a strenuous tour per se, we do have numerous walking tours of towns / cities on uneven surfaces. One must be prepared to be on one's feet, walking at a leisurely pace for up to 3 hours at a time, and to walk short distances, ie from the hotel to dinner. Traffic and road conditions may make some journeys seem longer than they should. Our trip rating level "2" reflects the ambitious nature of our program, some full travel days, heat, the lack of unreliability of creature comforts in some locations (hot water, air-conditioning etc that may fail), and limitations for those requiring/insisting upon very specific dietary requirements. Tour operator is a Canadian-based company, and do not operate within USA legal jurisdiction and do not hold express permission from the State Dept with regard to USA passport holders. As the traveller, it is your responsibility to familiarize yourself with the rules and to decide whether or not to travel. For information, please visit Travel.State.Gov website. Cuba is a warm and tropical place most times, and one should be prepared for heat. That said, we will notice a cooling effect when up in the mountains or near the sea. The northern side of the island also tends to be cooler than the Caribbean side. A light rain shell is recommended for all times. The cooler and most comfortable time of year in Cuba is November-March. This is "high season," and we recommend early booking to ensure space at preferred accommodation and flights at a reasonable cost. May and October are considered "shoulder" season; these months can be hot but still a pleasant time to visit. We avoid the very hot summer months (Jun-Sept). 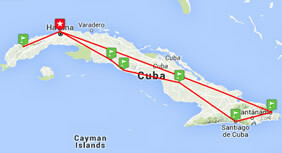 Ours is a cultural/historical journey designed to explore a side of Cuba that is thus far not exposed to mass tourism. 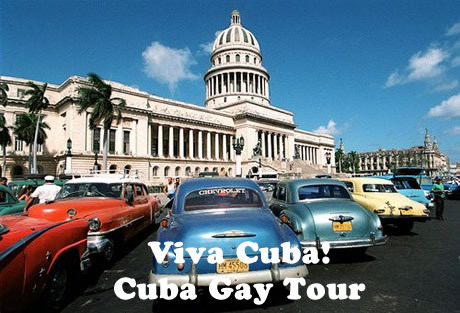 Most overt local gay life occurs in Havana, and most gay visitors tend to head straight for the many resort properties along the highly developed north coast (indeed many of our travellers book extra time at a resort or in Havana in association with our trip). As such, the smaller, more conservative towns and cities we visit won't have anything to offer in terms of a "scene". Though Cuba is still a devoutly Catholic country, the relaxed aspect of Caribbean culture is fostering a general live-and-let-live attitude that is seems especially applied to visitors who are given greater leeway in terms of local social mores. Like a lighthouse, the Hotel Armadores de Santander stands as a beacon and symbol. A beacon because it signals the entrance to Old Havana's historic core and the intriguing sites therein. It's also a symbol of the city's rich maritime heritage (reflected in the interior décor). Enjoying a cold beer on the front patio or rooftop terrace to watch the world and ships go by is highly recommended. Everything here from the colossal wooden doors opening on to the bar, the Chesterfield sofas in the lobby under beautifully ornate ceilings, and the marble stairs leading to the guest rooms (there's also an elevator), recall bygone days. While you're likely to spend more time out exploring or on the roof terrace taking in the 5-star Old Havana views, keen observers will appreciate the attention to detail here. Check out those Lloyd Loom chairs in the plant-festooned hallways and the maritime images covering the walls. Armadores de Santander is the perfect compromise for those who want to be walking distance from all the allure and offerings of Old Havana, but not quite in the thick of it. And then there's that sweet, savory breeze coming off the water, which few other properties have in such delicious doses. Los Jazmines is located in an enviable position looking out over the stunning Vinales valley, with picturesque peaks you'll see alternately bathed in sun, moon & mist – making this hotel a must for photography enthusiasts. Horizontes Los Jazmines is a hotel whose charm goes beyond its fabulous views, with some of the friendliest staff you are likely to meet in Cuba. You will find all you need for a relaxing break on site, including an attractive mahogany-fitted bar, souvenir shop & spa where you can unwind with a massage. Los Jazmines has a large, well-maintained pool with amazing views over the valley, while local attractions such as the limestone caves, Vinales tour & tobacco farms can also be booked through the hotel. You will find a warm welcome, excellent service & the most unique, breathtaking views. And if you bring a camera you won't be disappointed.